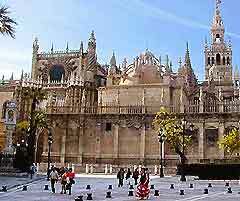 There are a large number of churches, cathedrals and religious buildings to be found in this historic city of Seville. Seville's Iglesia de San Julián is a 14th-century Gothic-style church that is situated in the historic city centre of Seville. Dedicated to the Patron of the town hall, the Virgen de la Hiniesta, this church has many beautiful features, such as a 400-year-old statue, sculptures, silver lights and an 18th-century altarpiece. There are several buses that run to the Iglesia de San Julián in Seville. The majestic cathedral stands on the site of an ancient 12th-century mosque. Construction of the cathedral started in 1401 and took more than 100 years before it was finally completed. Highlights include many works of art in the chapels, a large courtyard full of orange trees, Roman features, detailed architecture and some important tombs. The cathedral's tall bell tower, La Giralda, is open to the public and visitors to the cathedral can climb to the top, where there are superb panoramic views of Seville. Seville's Iglesia de San Nicolás was built in the 18th century and is situated in the historic centre of the city. Highlights include five naves, a large altar, marble columns, ornate silverwork and some splendid sculptures, such as the statue of San José that was created in 1678. The Iglesia del Sagrario in Seville is full of fabulous features and detailed architecture. Built in the 17th century, this chapel is situated in the historic centre of Seville, within the cathedral. There are numerous stone sculptures, a grand and impressive altarpiece, an important crypt and many other stunning features. The chapel can by easily reached by foot or bus. With a simple and yet elegant facade, the Iglesia de la Caridad in Seville is also known as 'Señor San Jorge'. Built in the 17th century, this church is located in the Arenal district of Seville and is part of the Hospital de la Santa Caridad. Highlights include a small dome, numerous beautiful paintings, detailed stone sculptures and some of the best Baroque architecture in Seville. Situated in the Nervión district of Seville, the Iglesia de San Bernardo has a fantastic interior, flooded by natural light from the church's large dome. The main feature of the church is an enormous painting of the Final Judgement, which hangs in the 17th-century altarpiece. Built in the mid-19th century, Seville's Iglesia de San Ildefonso is full of numerous works of art, including paintings and beautiful, stone sculptures. The church has two impressive baroque-style towers that give the church a temple-like appearance. Situated in the historic centre of Seville, the individual Iglesia de San Ildefonso is easy to find. This beautiful Seville church has much to offer visitors. Inside are several detailed, 17th-century baroque sculptures and outside, the large tower is an impressive feature of the chapel. The Iglesia de San Marcos can be found in the heart of historic Seville. In the historic centre of Seville, the Iglesia de El Salvador was constructed on the remains of a mosque that dates back well over 1,000 years. With some remains of the mosque still present, this is a famous church in and around Seville. Highlights include a tall bell tower, a collection of altarpieces dating back to the 18th century, fountains and large, established orange trees. Open hours: Monday to Saturday - 08:45 to 10:00 and 18:30 to 21:00 , 10:30 to 14:00 and 19:00 to 20:45 Sunday and holidays. This church is located in the historic centre of Seville and was built in the late 18th century. With two tall towers and many important works of art, including numerous paintings, Seville's Parroquia de San Roque also features an impressive statue in the centre of the second altarpiece. Built in 1949, Seville's Basílica de la Macarena is the home of the much loved 'Virgen de la Macarena' statue. This image of the Virgin Mary stands above the principal altar, with waterfalls of gold and silver. There are also some interesting, modern wall paintings and a chapel with a sculpture of Christ. On Good Friday there is a wonderful procession that starts from this church. Situated in the La Macarena of Seville, the Basílica de la Macarena is easy to reach by bus. This Seville chapel is located in the historic centre of Seville, in the old university building and the grounds of the former tobacco factory. With many works of art from the university, including paintings and sculptures, the chapel also features several old statues, such as the statue of Christ that dates back to the early 17th century. Seville's Capilla de la Universidad is easy to reach by bus. The Capilla del Patrocinio in Seville is an important church in the city and is most famous for the statue 'Cristo del Cachorro' which was created for the church in the late 17th century. The statue is highly regarded and plays a large part in Easter celebrations at the church. Other interesting features in this Seville church include an impressive, painted altarpiece, sculptures and a number of religious ornaments. 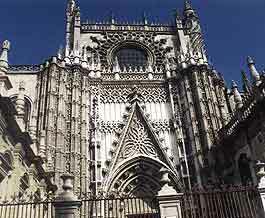 The church is located in the Triana district in Seville.